May & JuneIn late May, the herds leave the Western Corridor for the northern Serengeti plains and woodlands. The fresh, tender and mineral-rich pastures on the other side of the humans' border, in Masai Mara, are the irresistible bait for the animals to finally invade the Kenyan reserve, an event which usually starts in late June to early July. The troops coming from the south meet here another migratory contingent: the resident wildebeest herds of the Mara region. These animals reside in the Loita Plains and Hills, northeast of the Mara, until the dry season brings the tougher days and it is time to seek the evergreen Mara basin. July to OctoberThroughout the month of July, the herds cross the Sand River, a mostly dry tributary of the Mara which roughly follows the boundary line between Kenya and Tanzania. The parade takes the eastern sector of Masai Mara, surrounding the Keekorok Lodge area. 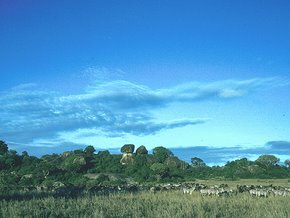 The trek follows westward, leading the herds to face the major challenge along their quest: crossing the Mara river and frequently also its tributary, the Talek. By then, the rains at the Mau Escarpment, where the Mara rises, have fed the stream to its highest levels. The steep banks are populated with trunk-looking basking crocodiles that seem almost to be expecting their annual banquet. The operation of fording the river is the most delicate along the migration, and as such seems to plunge the gnus in a state of anxiety that only relieves when the whole herd has crossed. The trekkers walk along the left (eastern) bank of the Mara looking for a suitable point to cross. There are plenty of preferred crossings along the course, which are easily identifiable by the lack of vegetation, the depressed slopes and the deep grooves carved by the animals' hooves. These are the most secure places to ford the river, those that ensure a minimal mortality. Nonetheless, the apparent programming of the whole process sometimes seems to collapse, and the nervous herds occasionally choose places where the banks are too steep and many of the animals break their legs down the cliff or fall flat into the waters. The herds gather at the suitable points and wander around nervously, their grunts sounding loud in the air. Eventually, one animal takes the lead and approaches the rim, scanning the opposite edge to analyze if any danger awaits after the crossing. When it finally dives into the stream, this seems to haul the rest of the herd. More animals follow in a single line across the river, while the lagged ones throw themselves towards the stream until the rearguard pushes the troops to a frantic race that ends up with some animals trampled to death, lying aside the course. Along the boreal summer, the crossings repeat over and over, and the survivors graze peacefully on the Mara Triangle grasslands unless disturbed by the early-morning and late-evening hunts of lion and cheetah, the latter preying on the calves.